Nova Systems UAV collaboration with Lextar Pty Ltd has resulted in a highly successful APPEA Exhibition. 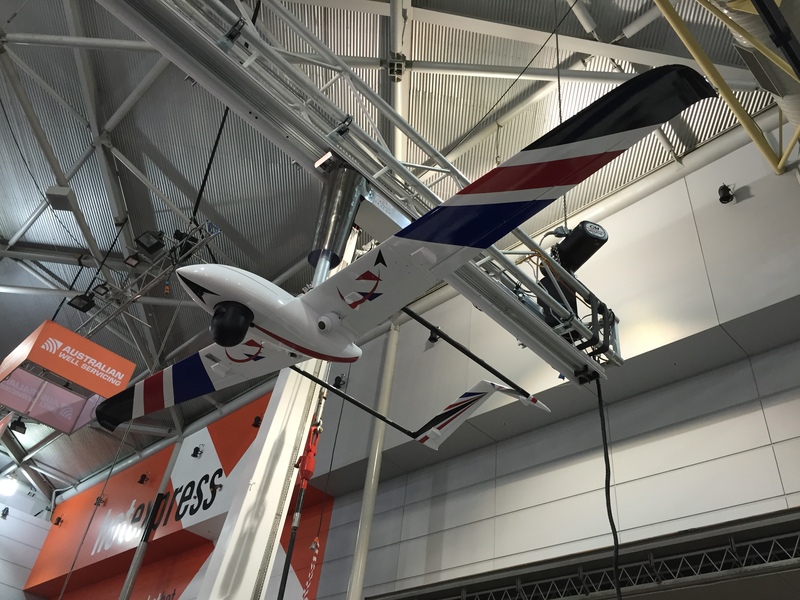 Nova Systems / Aerospace “hatched” a very unique and ambitious plan to demonstrating their UAV expertise at this years 2016 APPEA, Oil and Gas Exhibition. The project involved suspending a fixed wing UAV from Tracam’s robotic rail camera system on a 60m track. The system would travel the full length of the main entry isle just 3.5m above the attendees. The UAV was to support both optical and thermal camera sensors. The system was to automatically turn the UAV so as it traveled in the forward direction at all time. Functionality was to be autonomous and / or be manually driven. Installation of the system was to be completed on the ground and then raised in its entirety on a gantry, using synchronous motorized endless chains. Tracam was the perfect platform for this ambitious engineering concept. Nova’s engineering team custom designed, built and tested all relative support hardware, electronic interfaces and software. We (Lextar Pty Ltd) made available our facility and R&D lab. Having the collaborating parties share the one facility made for a a very effective and efficient development process. Lextar’s experienced R&D team provided engineering support, facilitated custom changes to accommodate the extra weight and unique functionality of the UAV. Mobotix also supported the project, offering their S15 product. The S15 thermal Sensor and 6MP daylight sensor proved to be ideal for the application. Thermal cameras and in particular Thermal vision in conjunction with Optical vision provide drones and UAVs with unique capabilities including day / nigh flying , bush-fire detection and management capabilities, search and rescue features along with large scale systems diagnostic capabilities. Nova’s project success was measured in the quality and volume of contacts gained during the exhibition and the unmatched overt exposure gained. This very positive result strengthens further Lextar’s commitment to it’s collaborative R&D business strategy.